LaJune (McDaniel) Bales, 96, of Oxford, Kansas passed away Saturday, January 12, 2019 at Winfield Senior Living Community. Funeral services will be held at 10 AM Wednesday, January 16, 2019 at the Oxford United Methodist Church. Burial will follow at the Oxford Cemetery. Visitation will be held on Tuesday, January 15 from 9 AM – 6 PM at the Oxford Funeral Service chapel. In lieu of flowers, donations in memory of LaJune may be made to the Salvation Army, contributions may be left in care of the funeral home. LaJune was born on October 27, 1922 in Rock, Kansas the daughter of Herbert and Martha (Hahn) McDaniel. 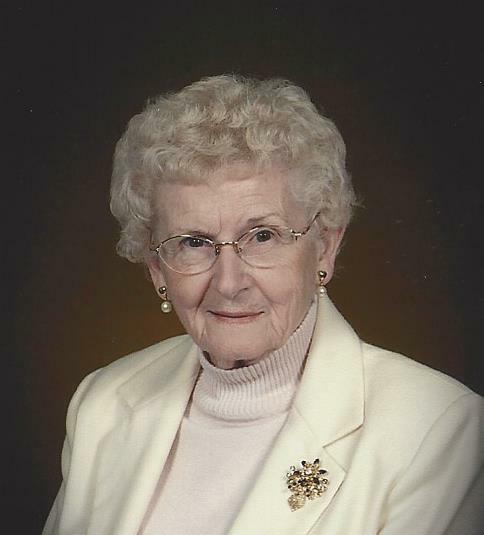 She attended Green Valley Elementary school and graduated from Oxford High School in 1940. On April 25, 1943 LaJune married Sam Bales at her parents’ home in Rainbow Bend, Kansas. They made their home in Oxford and enjoyed many years in the community. She loved being a homemaker and raising her family, she also enjoyed playing piano, collecting Betty Boop memorabilia, quilting and being a member of the Quilting Guild, the Bag Ladies, the Order of the Eastern Star, the Red Hat Society, the Mothers’ Club; she was also a member of the Oxford United Methodist Church since 1959, she enjoyed many years of fellowship there and helping with church meals. LaJune and Sam owned the Oxford grocery store for 17 years and she worked at Boogaart’s in Winfield for 10 years. She is survived by her children: Ronald Bales and wife Jan, of Mulvane; Clifford Bales and wife Anita, of Oxford; Robert Bales of Wichita; Carolyn Mosely of Tulsa; grandchildren: Tiffany Spencer and husband Troy of Wichita, Clinton Bales and wife Amy of Denver, Casie Katzer and husband David of Osawatomie, Ashley Bales and Morgan of Mulvane. Great-grandchildren: Maclaine and Madison Spencer of Wichita, and Holton and Hudson Katzer of Osawatomie, and Aryana Bales of Mulvane; sister Illene Hutchins of Geuda Springs; and numerous nieces and nephews. LaJune is preceded in death by her husband, parents, son-in-law Alan, brother Howard McDaniel, sisters Doris Sisson and Iris McCrabb.